In The Avon Catalog For Campaign 5 you can get select Men's Watches 2 for $50. 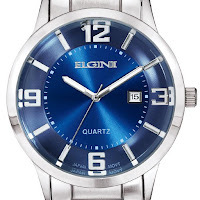 In this post we are featuring the Gorgeous Men's Elgin Watch. The regular retail value for this watch is $100.00. There are several diffent watches this can be mixed or matched with including the NFL Watch And Keychain Set. There are also several discount codes posted in the right side column for an additional 20% off. Shipping is free on $40.00. Avon Catalog. Awesome Inc. theme. Powered by Blogger.